You might think as I did: Oh no, not yet another slapdash tribute album. The world is full of them, and you can count the ones that are really worth a listen on one hand. What makes “The Art Of McCartney” different is its sheer scope and the fact that the man himself, although not in any way part of the proceedings, still is very much present. When approached by American producer (and Beatles/McCartney-fan) Ralph Sall back in 2003, Paul gave the project his famous thumbs up. Recruiting key members of Paul’s backing band was a clever move. The guys knew his songs inside out, and as they are the core players on most of the tracks, they give this collection a unity that most tribute-albums lack. And being Paul McCartney’s band, they certainly make sure that his presence is felt, even though he is nowhere to be seen or heard. The downside is of course that they are so familiar with Paul’s original arrangements that you can’t expect them to deliver any big surprises. Why tinker with perfection? Performing live Paul always stays close to the blueprints of his original studio recordings. And so does most of “The Art Of McCartney”. There are exceptions as some of the participants use their own handpicked musicians and provide the set with some left turns that are most welcome. The biggest surprise is the sound of Bob Dylan’s croaky, world weary voice taking on The Beatles-chestnut “Things We Said Today” – he keeps the familiar triple flick of the wrist chord that drove the 1964-classic along, injecting it in a tight and groovy arrangement that could just as well have been part of his “Tempest” album. The other big suprise is “Come And Get It”, the Badfinger-hit, now transformed into a fat and skanky chunk of reggae by Toots Hibbert with Sly & Robbie. Some ignorants still think Paul McCartney was the soft one of the Beatles, the balladeer, while John was the rocker. Well, it’s still not too late to wake up. 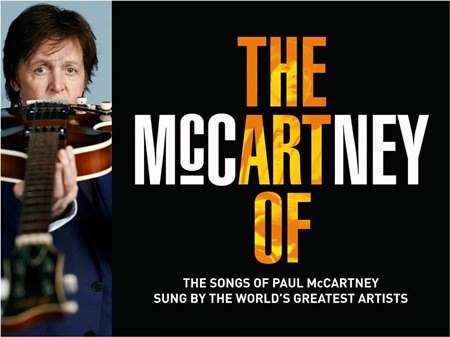 “The Art Of McCartney” does have its moments of softness and fragile beauty as well as his trademark playfulness, as it should, exposing his versatility as a musician, singer and songwriter, but more than anything this is a powerful and rocking album. Billy Joel certainly doesn’t hold back in his versions of “Maybe I’m Amazed” and “Live And Let Die”. Paul Rodgers delivers “Let Me Roll It” every bit as raucous as Paul intended back in 1973, and then some. Roger Daltrey takes on “Helter Skelter”, a song that originally was intended as The Beatles’ answer to the thundering The Who-masterpiece “I Can See For Miles”. And there’s more, a lot more, like Def Leppard (“Helen Wheels”), Kiss (‘Venus And Mars/Rock Show”), Sammy Hagar (“Birthday”), Robin Zander & Rick Nielsen (“Jet”). But in between you find delightful moments like Willie Nelson doing “Yesterday”, Ronnie Spector doing a semi-Phil Spector version of “P.S. I Love You”, Wanda Jackson igniting in “Run Devil Run”, Brian Wilson doing “Wanderlust”, Smokey Robinson delivering the definitive version of “So Bad” and Yusuf/Cat Stevens making “The Long And Winding Road” his own. Personally I found great pleasure in hearing Steve Miller’s “Junior’s Farm” as I always thought that Wings-single was a homage to him in the first place. The list is next to endless as this four-album-project contains 42 McCartney-songs (of which only 17 are Beatle-tracks). I have one objection though, and it is an important one: Too many of the tracks are almost spitting images of the original arrangements; a bit louder and more basic, maybe, some more guitar and less of the magical dust that graces his own productions, but still so similar you automatically compare them to Paul’s own versions. Not surprisingly, the originals win, hands down. But then again, this approach to the songs does create the unity I mentioned earlier, and the band, being as tight and good as it is, makes sure the results are never less than entertaining. It is a parade of famous voices and faces doing Paul in Paul’s own backyard. On top of that you get the rare moments when some of the artists deliver more personal interpretations, like Bob Dylan, Toots Hibbert and B.B. King, and those moments add to the listening experience and make the project breathe. The only duff track on the albums is “Hello, Goodbye” performed by The Cure with Paul’s own son James. It stays close to The Beatles’ arrangement, but ends up as a very clumsy effort indeed. What were they thinking? And by the way, who would have expected Alice Cooper to do “Eleanor Rigby” (and then follow it up with the eccentric, but wonderful choice of “Smile Away”, bless him)? 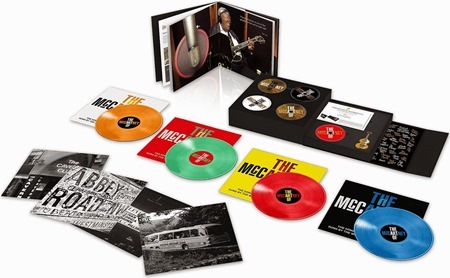 I bought the deluxe package that apart from the four vinyl albums (on orange, green, red and blue vinyl) contains 3 CDs with music, 1 CD with an audio documentary, one DVD with “the making of…” plus a specially designed Höfner guitar shaped USB with 34 of the songs on flac files. And then there’s the hard cover book, 2 pieces of artwork by Alan Aldridge and 4 black and white art cards. All this and the Certificate of Authenticity that proves that I am the 707th of the 1000 lucky ones who own this monster. They didn’t make packages like this in the 60’s, that’s for sure!